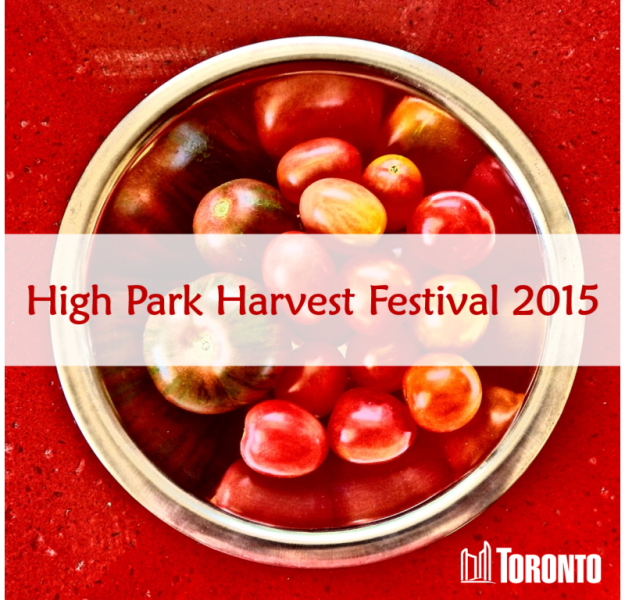 The end of summer means gearing up for our High Park Harvest Festival! Come celebrate the harvest with us alongside our friends at Colborne Lodge. It’s quite the family affair with activities, food, vendors (at the lodge), crafts, music, and did we say food? So much to see and do you can spend the entire afternoon! So drop by and check out all the activities at the south end of High Park! We’re always looking for volunteers for Harvest Fest! We can use volunteers for set-up, clean-up, serving food, doing dishes, plus helping with crafts and activities. You can stay for the whole day (and we’ll feed you!) or help out for an hour or two (and we’ll still feed you!). Please contact us if you’re interested in helping out at kidsgrow@toronto.ca. This is it! The celebration of the year 🙂 Join us on Sunday, October 2 from 12 pm to 4 pm for this year’s High Park Harvest Festival. You can enjoy our free harvest lunch, music, meet Professor Pricklethorn, make seed balls, leaf pounding bookmarks, dream pillows and more! You can also check out the great things happening around the corner at Colborne Lodge Museum! Activities run from 11 am to 5 pm. A special Haudenosaunee (Iroquois) Thanksgiving Address on the West Lawn lead by Mohawk Elder William Woodworth Raweno:kwas will open Harvest Fest. They also have vendors, music, artisans and baked potatoes for sale. So much to do you can spend the day in High Park! We look forward to seeing you at the Garden on Sunday! 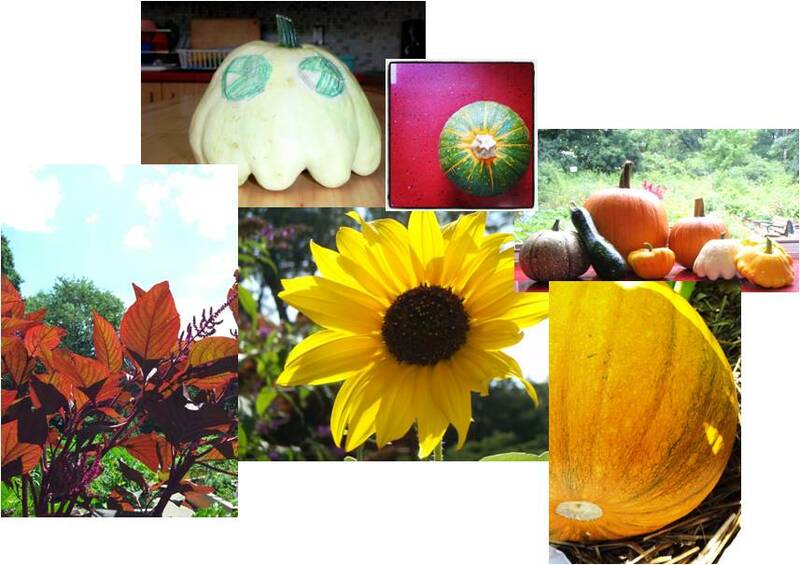 High Park Harvest Festival Oct. 5th, 2014! 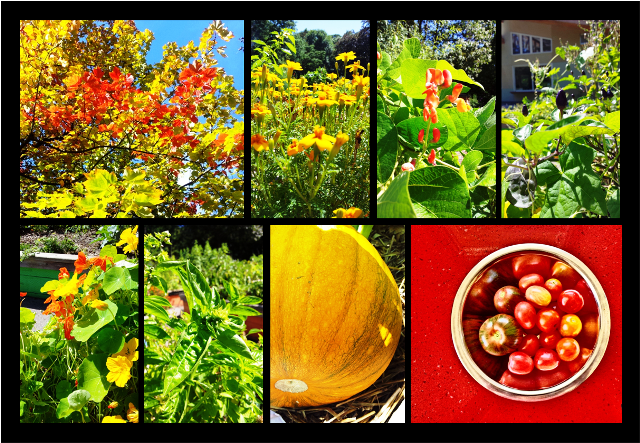 We’re excited to say that it’s Harvest Festival time once again! So many fun things happening this year including a visit from Professor Pricklethorn, ChocoSol Traders, The West End Flower Fairies, music by Margaret Christl, and Maria’s hosting another tea party. Of course we’ll also have our free harvest lunch (while it lasts! ), fun garden crafts and Teaching Kitchen Tours throughout the afternoon. We could also use a few helpful volunteers throughout the day (we start around 9 am and go until about 6). Shifts from 2 hours to all day are available. We promise you won’t get stuck doing dishes the whole time (we’ll also make sure you have time to get out and see all the fun stuff happening throughout the site)! Contact us if you’re interested in volunteering (kidsgrow@toronto.ca or 416-338-5055). 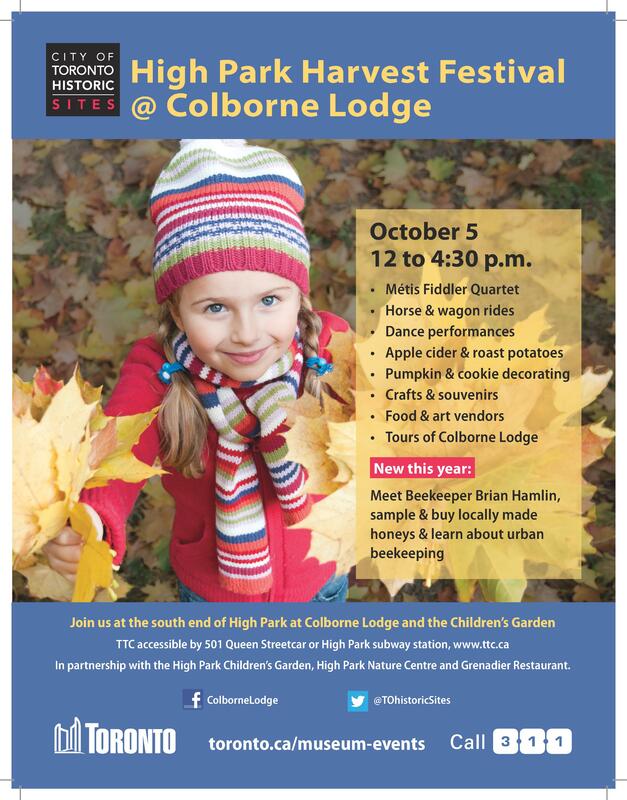 The High Park Harvest Festival is hosted by the Children’s Eco Programs, The Colborne Lodge Museum and the High Park Nature Centre. It’s a free event and all activities at the Children’s Garden are free. There is a small charge for a variety of activities at the Lodge and for the horse drawn wagon ride. There are also a few vendors selling interesting (and often tasty) stuff at Colborne Lodge Museum! So excited about Harvest Fest this Sunday! Join us from noon to 4:30 at the Children’s Garden for food, fun and great activities for the whole family! Professor Elwood Pricklethorn will be joining us at 2 pm and Chocosol will be there to hand out yummy chocolate samples. Other guests include Live Green Toronto and Jenia’s Ukulele Jam! Plus Colborne Lodge will have vendors selling corn and other tasty treats plus wagon ride tickets. Join us for our free harvest lunch (while it lasts! There’s even pumpkin pie 🙂 ), nature crafts, a Harvest Jam with Nikki (1 pm & 3 pm), meet Professor Pricklethorn at 2 pm and decorate your own reusable lunch bag with the folks from Livegreen Toronto. Don’t forget to check out the activities down at Colborne Lodge Museum (activity fees may apply) and take a tour of the Lodge (pay what you can entrance fee) and find out how the Howard’s celebrated the harvest.